Enjoy miles of beautiful ocean views on events ranging from 5k to the marathon. The course is great for all levels, with a flat run along the coast to keep you cool and a moderate hill at Vista Del Mar to keep you on your toes. Come for the free beer and tacos at the finish line. Want to be part of the biggest and best event to kick off the spring running calendar? Philadelphias Love Run half marathon is the main event. This race weaves you through all the great sights of the City of Brotherly Love. Thousands of athletes and spectators combine to build an electric atmosphere, making this event unforgettable. If youre not feeling quite ready to tackle the half marathon, you can still experience the buzz by taking part in the #allcity5K. After party at the finish! You will run the awesome streets of Philadelphia passing some of the Nations most historical landmarks to wind back past friends and family lining the Benjamin Franklin Parkway where you will enter Fairmount Park. You will run through the picturesque roads of the park to make your “sprint” to the finish in front of Eakins Oval and home of the “Rocky Steps”. 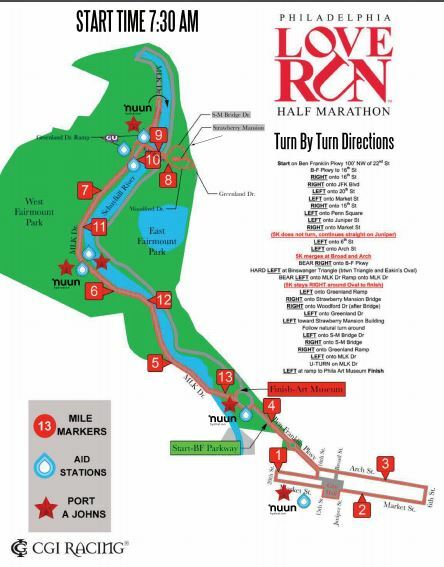 The course will take you on roads you love to run with some new, exciting additions and offers many areas where your family and friends can cheer you on. The Love Run takes you through even more of downtown Philly which means just one small hill in Fairmount Park. Making for a super fast, super fun course! Again we are …the race that loves you back – always improving to offer you the best half marathon experience. 9:00 AM – 5K Awards Presentation to Overall Winners Only – AG awards are mailed to all winners. 10:00 AM – Half Marathon Awards Presentation to Overall Winners Only – AG awards are mailed to all winners. What would your incredible accomplishment be without an unforgettable celebration at the Finish Line Festival with family, friends and fun! Team VIP area will feature thousands of team members celebrating and tailgating. Teams with 20 or more are awarded their own tent and/or private port a potty. Don’t miss the CGI Racing prize patrol tossing out tons of great free prizes from the main stage. Enjoy Philly Phavorites like soft pretzels, Tastykakes and other delicious post race fare. There is no packet pick up race morning. We offer several great options to get your packet. 1. Have it mailed to you. This option expires on 2.15.19. This option is offered on the entry form. This option is limited and based on availability. 2. Pick it up at the health and fitness expo. Your confirmation form which will be emailed to you the week of the race. You must present photo ID when picking up your packet. 3. Have a friend get it for you. You must give them a copy of your photo id. Center City is compact and very walkable. If you don’t feel like walking (or running) we would suggest public transportation. Philadelphia’s mass transit system, SEPTA, offers two subway lines, regional rail service to and from the surrounding suburbs, and bus service throughout the city. Several SEPTA buses (Nos. 7, 32, 38, 43, and 48) currently serve the Museum area. If you get to the race early enough, you may also find free street parking in and around the race area. By Car: Philadelphia is conveniently located just 2 hours from New York City and 2.5 hours from Washington, D.C. Major access routes include I-95, I-76, I-476, along with the Pennsylvania and New Jersey Turnpikes. By Rail: Amtrak operates from 30th Street Station in Philadelphia with service along the Northeast Corridor. 30th Street Station is just a few minutes cab ride (or about a four minute run) from Center City. By Air: Philadelphia International Airport is served by most major airlines. Several new discount air carriers provide affordable and convenient flights into Philadelphia. A cab ride from Philadelphia International Airport to Center City takes approximately 20 minutes for a rate of $30. Or, take the high-speed SEPTA train departing the airport every 30 minutes with service to Center City. One-way train fare is $7.00. Wear comfortable running gear. Make sure to check the weather before you travel. Spectators are welcome and encouraged. They are a big part of the awesome atmosphere at the Philly Love Run. If you are watching a friend or loved one make sure you know their bib number in advance as this information cannot be passed out publicly - HIPPA rules. And, if you want to be waiting for them at the finish line, get there ahead of their estimated finishing time so you can give them a big (sweaty) hug on arrival. The best viewing points are at the start, the 4 mile mark, and the finish. Volunteers are essential to the Love Run Philadelphia Half Marathon. Each year, the event relies on an army of over 2,000 dedicated volunteers to assist with setting up, managing and dismantling the course. Much like the spectators, they are a huge part of the atmosphere and what makes the Love Run such a great event. Generous donations will be made to the charity of choice of volunteer groups of 20 persons or more. So grab some friends and sign up soon. The more volunteers, the larger the donation. Whoever it is that is racing, be it family or friends, or maybe you just want to watch, we encourage you to take part in the cheer zone. This is where the athletes get a much needed boost of energy from the crowd, spurring them on for a big finish. Make as much noise as you can an be part of something special. The medical command center will be at the finish line along with a medical spotter tent. Medical will be positioned on mobile units along the course with a med station at mile 9. Please make sure you fill out the emergency info label on the back of your bid and share your bib number with loved ones. Due to HIPPA laws we cannot give out any athlete information other than bib number. What is the minimum age to participate in the race? 13, however anyone under 13 but older than 10 may participate as long as they are accompanied by a registered adult through the entire course. Can I sell or give my bib to someone else? No. You may not sell or transfer your bib to another person. Please do not do this as you jeopardize not only that runners safety but the safety of other runners on the course. We offer a very flexible refund policy in the event you cannot race. It is posted under Event Info. What if I bandit the race? This is not only unfair because everyone else paid the entry fee but it is truly a safety issue. We plan the course, the medical, the water, the replacement gels/fluids based upon the total entrants. If you bandit the race you are jeopardising the safety of our legitimate runners. We also provide finish medals to those who have registered and if you, as a bandit, take a medal there is a chance that others (again who legitimately entered to run the race) will not receive one. Not cool. Can I use a baby jogger, roller blades, scooter or bike? No. These items are all strictly prohibited from the race course. Can I use headphones or earbuds? The rule prohibiting headphones is no longer enforced by USATF; however, the Love Run Half Marathon recommends you do not wear them during the race. Runners’ ability to hear and react to situations and directions given by race officials is very important. Your safety is always our topmost concern. Is there a gear check? Gear check will be located in the main event area at the finish line which is within walking distance to the start. Is the race walker friendly? Absolutely. You must hit mile four in 1 hour and 20 minutes of start and you must complete the race in 3.5 hours otherwise you can finish but unsupported. Can you say BLING?! It’s all about the finish medal, right? Big medal, big accomplishment. Wear it proudly. Every runner gets this glass coffee mug. Add this to your Love Run collectors series. Be sure to celebrate your incredible finish with a free beer, great music, tons of giveaways & fabulous food! Think Vanity Plate and be creative! Put your message on your bib..a nickname, a cause, your name (boring). How was Love Run Philadelphia?